Today I ran a ConfigMgr OS Upgrade task sequence configured to use the Enterprise edition of Windows 10 1709 on a workstation that had Windows 10 Pro 1703 installed. Since the VLC media for 1709 contains the various editions in different indexes, you are supposed to choose the relevant one in the Upgrade Operating System step. Of course, I expected the TS to fail because the configured edition is different to the edition that TS was being run on – but to my surprise, it didn’t care and the TS succeeded! Windows 10 Pro 1703 was upgraded to Windows 10 Pro 1709. Not sure if that’s a bug or a feature, but it’s actually quite convenient! So finally I got around to doing some Windows 10 deployments (better late than never :)) and I wanted to set the default wallpaper during Operating System deployment with Configuration Manager. I’ve seen a few posts out there about how to do that, but they all run during the OS phase of the deployment, which means you have to take ownership and set permissions on all the image files. However, you can bypass those permission changes by setting the wallpaper during the WinPE phase of the deployment instead. I wrote a post about that before, but it was only tested on Windows 7. In Windows 10, the process has changed a bit. In addition to the \Windows\Web\Wallpaper\Windows directory that contains the “img0.jpg” default wallpaper image, there is now also a \Windows\Web\4K\Wallpaper\Windows directory, which contains images of various resolutions. It seems that if the screen resolution is set to the resolution of one of the images in the 4K directory, it will use that one as the default. The “img0.jpg” image file can be around 1920×1200 to match the default size. Since I am using MDT-integrated ConfigMgr (and you are too, right?! ), I’m simply going to place all these image files in the Scripts directory in my MDT toolkit package, together with the following PowerShell script which will replace the existing image files with the new ones. I am adding this step during the Post Install phase, just after laying the OS image on the disk. At this point, we are still in WinPE, so we are not changing the online OS and therefore no permission changes are required. And that’s it! Now all the default wallpaper images will be replaced with my custom ones. The beauty of doing this during OSD is that the end user can still change the default image if he wants to. If you prefer to lock the default wallpaper, then consider using group policy instead. Today I’m releasing a new tool for ConfigMgr admins and IT support staff! This tool displays PXE boot events in an easy-to-view format and provides a history of PXE boot attempts on a distribution point during a selected time period. The tool can also display any records that exist in ConfigMgr associated with a device based on its SMBIOS GUID. 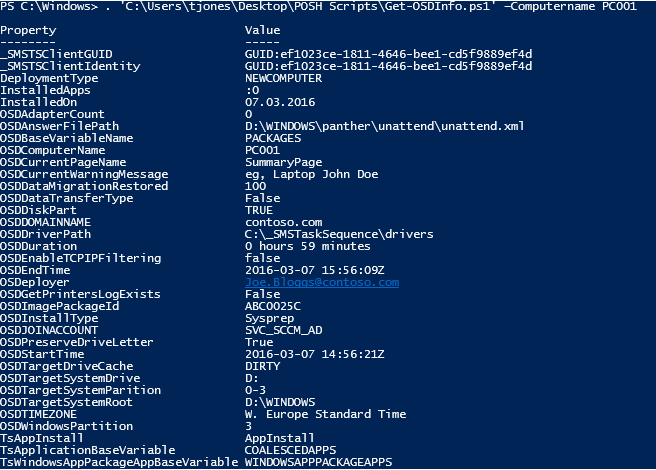 The ‘log’ entries returned come from the status messages sent by the distribution point and not from the SMSPXE.log. 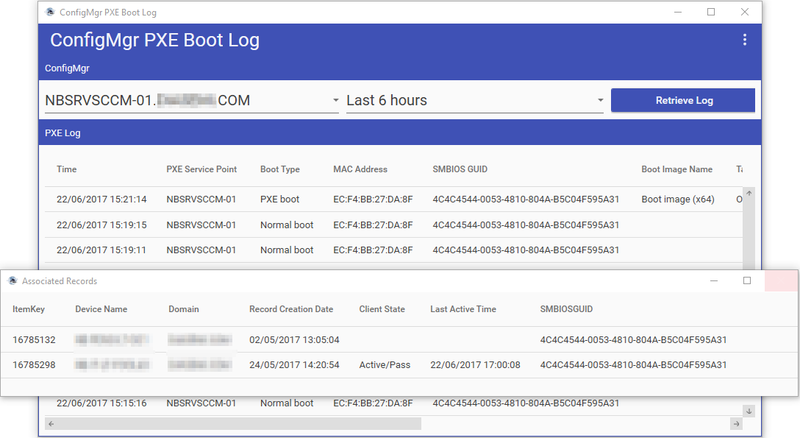 The tool can help in troubleshooting PXE boot failures such as devices not being targeted with a deployment, duplicate records in the ConfigMgr database, or mismatched unique identifiers because of hardware changes. The tool can be downloaded and installed from the Technet Gallery. Optionally select to view dates and times in your local timezone instead of the default UTC. Select a PXE-Enabled distribution point from the drop-down list. Of course, that’s only ever partially true, because with PowerShell you must work harder today in order to work smarter tomorrow, but in the interest of long-term benefit I proceeded to fire up the ISE. You simply find the model and operating system version you want and click the link, which leads you to another wiki page containing a download URL. The resulting script is quite simple to use and works reliably in my testing, although it takes a few seconds to filter the HTML in order to find the appropriate download URL. Just provide the model name, operating system version and a location to save the downloaded file to. Support is provided for verbose output. The script will work for any driver pack with an operating system Windows 7 or higher (are you really deploying anything older than that?! ), and there is no proxy support currently. Just released a new free application for ConfigMgr admins – ConfigMgr Deployment Reporter. I developed this app for use in the organisation I currently work for, and it turned out quite well, so I decided to release a public version to the community! I developed this app as an alternative (and IMO easier) way to report on ConfigMgr deployments than using the ConfigMgr console. It uses a little different format than the console node allowing you to select which deployment you wish to view data for based on the “feature type” (ie application, package etc) and report on only that deployment. It also introduces a separation of results between all applicable systems for a deployment, and only those systems which have currently reported status, which allows for a more accurate view of the success of a deployment as it progresses. The app allows the creation of charts and HTML-format reports to give a nice graphical snapshot of a deployment. I also added the capability to report per-device for Software Update and Task Sequence deployments. For Software Updates, this allows you to see which updates from the deployment are applicable to the machine and the status of each update, and for Task Sequences it allows viewing the execution status of each step in the task sequence for the selected device. Download the app from here. 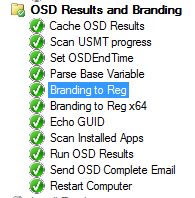 In MDT-integrated Configuration Manager, a UDI task sequence contains a couple of steps called Branding to Reg that brands OSD variables to the registry. This can be useful for reporting, and they can be inventoried with Configuration Manager using the handy RegKeyToMOF utility. These steps can also be added manually to a ZTI task sequence as Kenneth van Surksum describes in his blog series. You can edit this script to add / remove any variables you want to save in the registry. If you have custom variables that begin with “OSD” for example, these will be saved to the registry by default. I wrote the following PowerShell script to retrieve these OSD registry values post-deployment from any remote computer. The script includes a calculation of the deployment duration if the OSDStartTime and OSDEndTime variables are populated and adds it as OSDDuration. It only returns properties that actually have populated values. $Duration = "$Hours hours $Minutes minutes"
As a Configuration Manager administrator, from time to time I have to deploy an application where I need to notify the end-user of something before the installation begins. A recent example was a plugin for IE that would fail to install if Internet Explorer was running at the time. I can force-ably kill the running process of course, but that’s not necessarily a nice experience for the user – without warning their browser and any open tabs get closed. So better to notify them first, and give them a chance to close the application themselves and save any work. Rather than email each targeted user and warn them to close Internet Explorer before the plugin installs (which they probably ignore or forget anyway), I wanted the installation process to handle that by some kind of prompt. I could create a script wrapper for the plugin but that would necessitate running in the user context to display interactively. An easier way is simply to install it using a task sequence with some additional steps that will prompt the user first, kill the process if necessary, then install the plugin. A task sequence also gives me better logging. The problem with a task sequence is that it runs in the system context, so I cannot interact with the end user who is effectively working in a different session. This can be solved however by using the ServiceUI.exe that comes with MDT. Sometime ago I wrote a post about how to prompt for input during a task sequence, but in this case I don’t want input, I simply want to use a message box. I also want something reusable – so I don’t have to create a new package for each custom prompt. I have a nice PowerShell function that will create a message box for me using the Wscript.shell “popup” method, so I added this function to a script, where I have also defined the message parameters I want to use at the bottom. # -1               The user did not click a button before nSecondsToWait seconds elapsed. # The number of seconds to wait before closing the popup. Default is 0, which leaves the popup open until a button is clicked. # Define the parameters. View the function parameters above for other options. I place this script in a network share that everyone can access, and then simply call it during the task sequence using ServiceUI.exe. Once I have created and distributed the package, I create a new task sequence and add two “Run command line” steps at the beginning where I will prompt the user, one for x86 OS and one for x64. Call ServiceUI using a process that the end user is running. This enables ServiceUI to detect the session of the end user and interact with it. If you are using a task sequence deployment with the option “Show task sequence progress” enabled, then you can use the tsprogressui.exe process, however if you are hiding the task sequence progress from the user, then this process will not exist, so you can call Explorer.exe which is certain to be running in the user session. Use the “-File” parameter to call the powershell script that displays the popup. 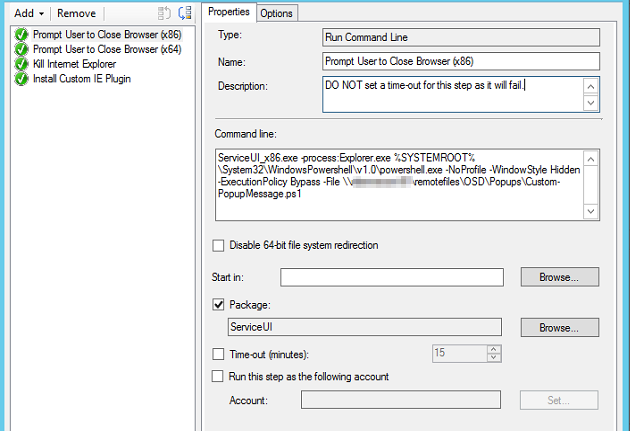 Do NOT use the “timeout” option in the step, as this will cause ServiceUI to give an access denied error. 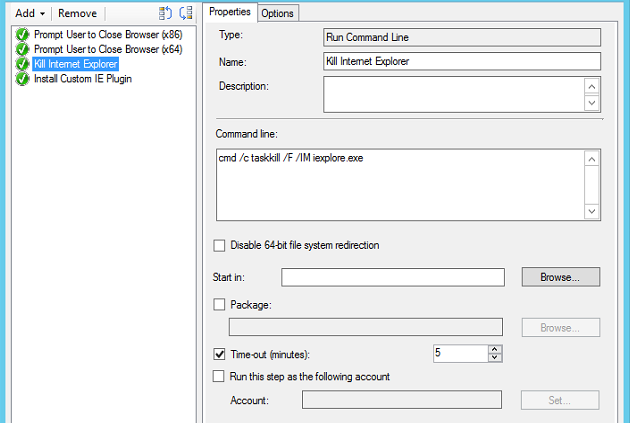 On the Option tab of the step, I use a couple of WMI queries so that the step only runs if the correct OS architecture is detected, and the Internet Explorer process is actually running. I don’t want to prompt the user to close IE if it’s not actually open. You could include the PowerShell script in the package with the ServiceUI executables, then you can call it locally instead of from a network share. 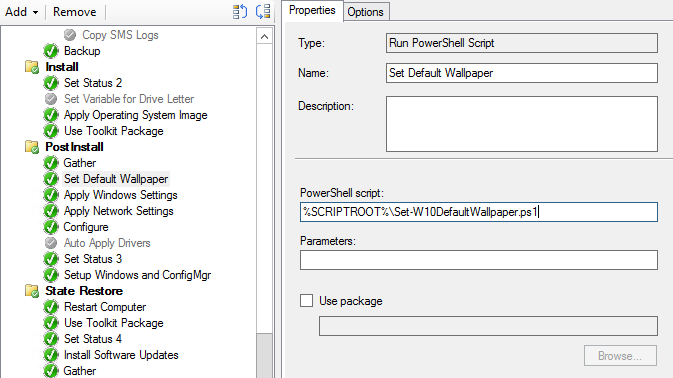 But the advantage of keeping the script and the executables separate is that you don’t need to create a new package each time you want to add a prompt – you simply reuse the ServiceUI package and create a new PowerShell script in the network share by copying and updating and existing script. If you are using the “Show task sequence progress” option, the script includes some code that will hide the progress UI temporarily while the popup is displayed, otherwise it may appear behind the progress UI. Don’t try to pass parameters when calling the PowerShell script, ServiceUI doesn’t seem to like that. The script function includes a “SecondsToWait” parameter – this is set to 0 by default, which means the popup will stay on the screen indefinitely until a button is clicked. In some cases this may not be desirable, so you can set a value here such that the task sequence will continue if no button has been clicked for some time. Next, in case the user ignored the prompt or it timed-out, we add another “Run command line” step to kill the process forcefully using taskkill, if it is still running. Then in the last step, we install the application itself. Now, when the application is deployed to the end user’s machine, the first thing that happens is they get a popup on the screen warning them to close Internet Explorer. You could customise this further by adding some code to the script that will set a task sequence variable based on the exit code of the popup function, which will tell you what button was pressed, for example Yes, No, Ok, Cancel, Abort, Retry etc. Then you could perform different activities in the task sequence based on the value of the variable.